Here are some amazing frog facts and facts about frogs. enjoy! There are approximately 4,800 recorded species of Frogs. A fully grown adult frog will have stout body, protruding eyes, cleft tongue, limbs folded underneath and the absence of a tail. They typically lay their eggs in water which hatch into tadpoles to later become a frog. More than one third of species are considered to be threatened with extinction. Group of frogs is called an Army. Group of tadpoles are called Knot. They do not drink Water but absorb it through their Skin. The Glass Frog (Centrolenella colymbiphyllum) has a skin that is translucent. 1 gram of toxin from a poisonous frog, like the Poison Dart Frog, can kill 100,000 people. They can lay as many as 4,000 eggs in frogspawn. The female Surinam toad lays up to 100 eggs and distributes them on her back so as to make it appear like a honeycomb structure. Frogs completely sheds its skin about once a week. They generally eat the shed skin. They blink while eating so that the force from its eyeball pushes the food / prey from its mouth to throat. Some Indonesian frogs have no lungs and breath only with their skins. Frogs can lay up to 4,000 eggs in one sitting! Frog bones are a lot like trees. The bones form a growth ring every year when the frog is hibernating. Scientists can count these rings to find out the age of the frog. Frogs absorb water through their skin, so they do not need to drink. Tree frogs have developed disks or suction pads on the toes of their feet to help them climb into the tree canopy. Frogs can live just as well in water or on land. Many brightly colored tropical frogs, called Dart Frogs, are colored in this way to warn predators that they are poisonous. Amphibians must shed their skin as they get bigger in size. The old skin comes off like a piece of clothing that has become too tight. Usually, this shed skin is eaten by the frog. 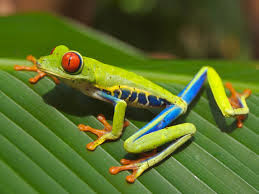 Frogs have long back legs and webbed feet for jumping and swimming. A frog can change the color of its skin depending on its surroundings. Frogs use a number of ways to attract a mate, such as courtship calls, body color and limb movements. Frogs range in size from 1cm to 30cm long. Some frogs can live in environments well below freezing. The Grey tree frog, for example, can survive even though its heart stops. It does this by making its own antifreeze, which stops its body from totally freezing. The eyes and nose of a frog are on top of its head so it can breathe and see when most of its body is under water. Another frog fact: People who study frogs and toads are called herpetologists. Herpetology is the study of amphibians and reptiles. Frogs eyes come in all shapes and sizes. Some even have square or heart shaped pupils. However, frogs only see in black and white. There are more than 4,000 types of amphibians in the world! The Golden Dart Frog is the most poisonous frog on earth. The skin of one frog could kill up to 1,000 people! The Red-eyed Tree Frog lays it eggs on the underside of leaves that hang over water. When the eggs hatch, the tadpoles fall into the water below. Experiments of frogs led to the discovery of the concept of electrical impulses in muscle contraction. Frogs and human have similar eye structure. Male Seychelles frogs carry young ones on their back till they become adult. Herpetology is the study of amphibians and reptiles. Frogs cannot live in the sea or any salt water.